I didn't know Norman well. I wish I had known him better. Several of my friends were very close to him and told me about his death last Thursday (October 20th). I dug out this picture I had taken of Norman several years ago (3? 4? I wish I could remember) when I bumped into him at the Vankleek Hill Farmers' Market on a Saturday afternoon. 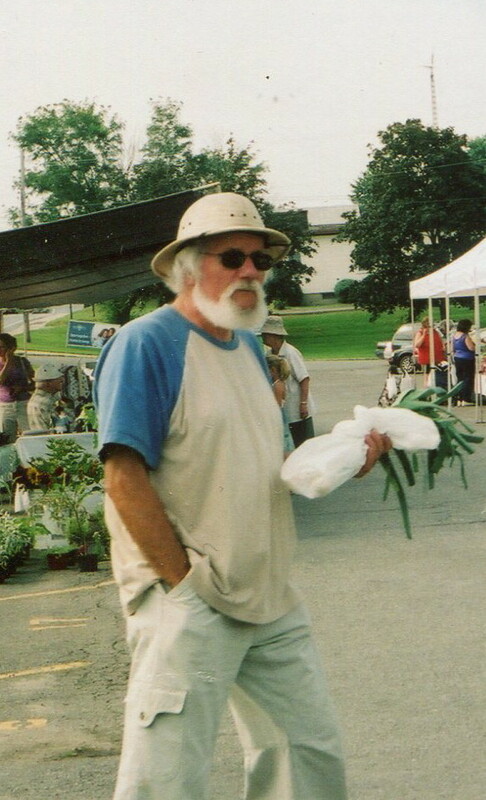 He was a marvelous cook and bought fresh vegetables there. I remember talking with him that afternoon. He was intelligent and widely read and interesting to talk to. This afternoon, I visited Norman's house. My friends have to organize all his belongings and take care of everything (a phenomenal amount of work). I was impressed, as I guess everyone is, by all the plants in the house. The living room has very high ceilings but it is almost filled by the plants. Most of the plants are mature, and huge, like this giant in the kitchen. Apparently, many of these plants are rare, not the kind of plants most people grow, and all very healthy. They are everywhere, in every room, hallway, nook and cranny. This group of plants is on the landing of the staircase. They looked beautiful in the light of the window. I thought this plant was in a pot with a face carved on it, but it was actually a mask sitting on the floor in front. It seemed appropriate for this plant, which is some sort of palm (I guess). Norman had many beautiful objects in his house, like this wonderful bass wood instrument (not sure what kind it is, but it is long!) that Holly is holding. Mac is holding more of the musical instruments from this amazing collection of objects. Organizing and sorting all these things will take a lot of time. But it is part of the process of saying farewell. Norman will definitely be missed. I heard about Norman's passing. I wish I'd gotten to meet him. What a fascinating house he had. My friend and I were lucky enough to go over yesterday and bring home some of Norman's plants. I will take good care of them!